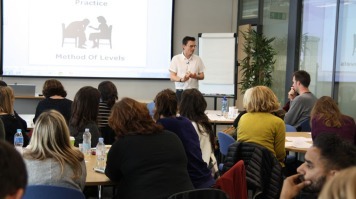 Part of the School's Continuing Professional Development (CPD) event series, the symposium was led by Dr Warren Mansell, a reader in Clinical Psychology at the University of Manchester. The event focused on the Method of Levels, a new transdiagnostic approach to CBT and psychotherapy, and how health care professionals can use this method to improve and develop their own practices. "This workshop is new for people and challenges assumptions about how to work with mental health problems, which methods to use and how to understand them," says Dr Mansell. Dr Mansell has been involved in CBT research since beginning his DPhil at the University of Oxford in 1994. He is the recipient of the British Psychological Society's 2011 May Davidson Award for his contribution to clinical psychology. The workshop involved demonstrations by Dr Mansell, small group discussions, audio and video clip screenings, and learning exercises. Attendees also had the chance to share and discuss their own experiences and issues with practicing CBT. "It's important to get the latest findings and techniques to the people who need to use them. I think a good proportion of people will start using this method. We are still a long way away, but every step counts. This method could be a revolution," says Dr Mansell. A range of practicing mental health professionals and trainees from different institutions attended the workshop. "I wanted to come to something that was on unfamiliar rather than familiar therapy, but a lot of what we are talking about is fundamental to all kinds of therapy," comments Chris Lewis, CBT therapist at IAPT Waltham Forest and self-employed councillor. "I think it's a really good workshop for building on our competencies and existing skills. I think this will enhance my practice when I leave today," says Oliver Schauman, trainee clinical psychologist at Royal Holloway University. The event was also attended by LSBU trainees, including Bryn Williams, a trainee CBT therapist doing a postgraduate diploma at LSBU, who found the workshop "very informative and eye-opening."